This chapter explores the role that information sharing has on the collective decisions made in supply chain management. 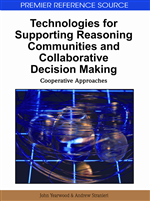 The authors identify information sharing as the critical factor in reasoning that occurs as stakeholders along the supply chain collaboratively make decisions. However, a shared conceptual model is required for determining what information must be shared. Their model identifies five elementsin information system management related to shared logistics projects: the enterprise‘s solutions (for each stakeholder and for the entire reasoning community), their deals, sharing management, organizational features and information and communication technologies related to the management of shared information. Moreover, the main accelerating and limitating factors are overviewed.The chapter illustrates the applicability of the model with a case study on the distribution of newspapers in France. Transactional collaboration: Logistics and transportation need consistent administrative practices and document exchanges. The first stage of collaboration consists of the common coordination and standardization of administrative practices and exchange techniques, requiring information and communication systems. Informational collaboration: This level of collaboration concerns mutual exchange of information such as sales forecasts, stock levels and delivery dates. It is important to note, that confidentiality and the process of competition can hinder collaboration. Operational planning: This planning stage is related to daily operations that can be coordinated or shared, like freight transportation or cross-docking. Tactical planning: The middle-term planning stage involves several tactical decisions, like sales forecasts, shipping operational decisions, stock and production management and quality control. At this level, sharing decisions can establish a relation of trust between the collaborators. Strategic planning: The highest collaboration stage is related to long term planning decisions such as network design, facility location, finance and production planning.